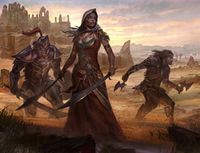 The Daggerfall Covenant is one of the three joinable factions participating in the Alliance War, the other two being the Aldmeri Dominion and the Ebonheart Pact. The crest of the Daggerfall Covenant is a lion, and its colors are blue and silver. It consists of the kingdoms of High Rock, the Kingdom of Orsinium, and the Kingdom of Sentinel. The alliance is an egalitarian association which uses its military might to secure lucrative trade routes. Led by High King Emeric of Wayrest, the Covenant seeks to capture the Ruby Throne in order to restore the Second Empire and return stability to Tamriel. Covenant players will begin on Stros M'Kai after being washed up unconscious on the shores of the island following their escape from Molag Bal's realm of Coldharbour. The marriage of King Emeric to Princess Maraya of Sentinel led to the Kingdom of Sentinel, under King Fahara'jad, entering a trade agreement with High Rock. The Orcs of Orsinium, led by King Kurog, joined the alliance after Emeric pledged to restore their kingdom following their assistance in Ranser's War; however, there are a number of Orcish tribes both in and outside of the Wrothgar Mountains who remain independent of the Covenant. The Daggerfall Covenant's home territory covers the traditional provinces of High Rock and northern Hammerfell, as well as the kingdom of Orsinium. The Covenant also have a territorial claim over the northern and northwestern parts of the Imperial heartlands. 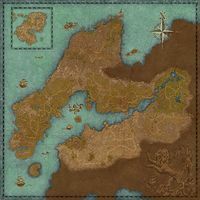 Daggerfall Territory — The northwestern region of Cyrodiil. Wrothgar is considered an independent kingdom under the terms of the Covenant, and has been declared a "truce zone" by King Kurog. As such, it is not marked as Covenant territory on the wiki. Quests with this marker are required for Cadwell's Almanac. For a full list of Almanac objectives, including any required side quests, please see Cadwell's Almanac: Daggerfall Covenant. This page was last modified on 12 July 2018, at 16:20.